Mumbai: BEST has repainted a few of its buses with a new colour scheme and has asked for feedback on them. Now, for the new livery itself. BEST has replaced its trademark red colour with a white livery and yellow stripes. Along with this, the BEST logo on the side has also changed marginally. They seem to have repainted some of the Purple Faeries as well, in spite of them being pulled out of service. However, the new livery looks grand on the Cerita bus. Let’s see what happens. Don’t forget to send your feedback. No, this is not an April Fool’s joke. Not even close to one. BEST has announced that beginning 17 April 2017, operations of all AC buses will be suspended. This information was announced via a Press Note dated 13 April 2017. This is a really sad thing. Mumbai is a huge city with a large number of vehicles. Cancelling AC buses would mean people will opt for cars/bikes/taxis. BEST was among the first to introduce AC buses, way back in 1998. Things began going downhill when in 2007, then General Manager Uttam Khobragade (named in the Adarsh Scam along with his daughter Devyani Khobragade of the US Underpaid Maid infamy) procured Cerita buses by fakely claiming that they were Chinese Kinglong buses. This is really a sad day for Mumbai. BEST had done all that it could in the last few months, from slashing fares, to introducing Happy Hours, to reintroducing cancelled AC bus routes. This is indeed a bad moment for us. Propaganda is a very misused, overused and abused word today. Politicians use it all the time to attack each other. In such cases, we should take a closer look at the word Propaganda itself. Merriam-Webster defines Propaganda as ideas or statements that are often false or exaggerated and that are spread in order to help a cause, a political leader, a government, etc. Of course, we can take the liberty of interpreting Propaganda as a more open nature of promoting oneself or ones interests to an audience. The most well known example of Propaganda is the 1940 film The Eternal Jew, directed by Fritz Hippler and produced by the Minister of Propaganda Joseph Goebbels under the Deutsche Film Gesellschaft banner. The film was nowhere near subtle, and portrayed Jews as Uncivilised, Parasitic and worse. However, times have changed and propaganda in its current form is very subtle, often using bias to have its way. In the recent times, propaganda has managed to make its way into the Transport sector too. When we say Propaganda in the Transport sector, we do not refer to naming stations, airports, roads and bridges after people. Mumbai has one major railway station and its airport named after Chhatrapati Shivaji. Bangalore has its central bus station and airport named after Kempegowda. This is a global phenomenon. New York’s major airport is named after former President John F Kennedy while it’s secondary airport is named after the 99th Mayor Fiorello La Gaurdia. The propaganda we look at is subtle, and in some cases, not so subtle. A BMTC Atal Sarige on route AS-6. Image copyright Binai K Sankar. At first glance, the Atal Sarige operated by the Bangalore Metropolitan Transport Corporation [BMTC] looks like its livery is is draping the bus with the National Flag. But. It’s wrong. If you take a second look, you’d notice that the colour scheme is White, Green and Saffron/Orange. The party colours of the Bharatiya Janata Party [BJP]. Further, the name itself is a giveaway. Named after former Prime Minister Atal Bihari Vajpayee of the BJP, the bus was meant to serve the poorest of the poor. Note: If you’re Mumbai, the highest fare is on a bus with its route number starting with AS, and if you’re in Bangalore, it’d be the opposite. And now, for a little Aesthetics. A TSRTC Metro Luxury Volvo at Lingampally. Image copyright LoveOfZ, CC-BY-SA 4.0 International, Wikimedia Commons. Pink is known to be a very soothing colour. It is often used to calm inmates in prison. However, the Telangana State Road Transport Corporation [TSRTC] bus above did not turn pink to soothe its commuters. Telangana State was formed in 2014, and the party that won a majority in its Assembly Elections was the Telangana Rashtra Samithi [TRS], whose party colour is Pink. Thus, everyone who sees the bus will remember the colour pink and every time there is a campaign by the TRS, people will be calm, because, Hey, Pink is a soothing colour. And now, for the most interesting, and perhaps most noteworthy form of Bus-based propaganda. Welcome to Tamil Nadu, where all the various divisions of the Tamil Nadu State Transport Corporation [TNSTC], the Metropolitan Transport Corporation [MTC] of Chennai and the State Express Transport Corporation [SETC] are like Chamelons. Remember the phrase “गिरगिट की तरह रंग बदलना” (Girgit Ke Tarah Rang Badalna)? That’s what TNSTC/SETC/MTC buses do. Change colours; Every time the government changes. It’s like an unwritten part of the party manifesto. Here’s a picture of an MTC bus taken in April 2011 below. It’s blue in colour. Blue is also a soothing colour, although I fail to understand why anyone would want to say ‘Feeling Blue’ to refer to Sadness. A blue coloured MTC Semi Low Floor bus on route number 21G. Image copyright Vinoth Thambidurai/CC-BY-SA 3.0 Unported/Wikimedia Commons. This picture was taken in April 2011, a month before the All India Anna Dravida Munnethra Kazhagam [AIADMK] government won the elections. Colour combinations were aplenty across Tamil Nadu. Some buses bore different shades of blue and yellow, some were white with Red, Yellow and Orange stripes across them, there were many. Now, they are all uniform. While, I did mention Fragmentation in an earlier post, it would be great if each city had its own identity in terms of colours. Here, Tamil Nadu is one single entity in terms of coloured buses. All long distance buses, including all SETC buses are now Green in Colour. They’re light green in colour with dark green stripes, or dark green in colour with light green stripes, depending on how you may want to look at them. Local buses, including all MTC buses all sport the same Brown-Beige combination which makes it look like the bus wasn’t washed at all. Perhaps a plan to not wash the buses regularly. Below, is one such repainted bus, taken in 2013, belonging to TNSTC Coimbatore. A TNSTC CBE bus at Vadavalli in Coimbatore. Image copyright Faheem9333/CC-BY-SA 3.0 Unported/Wikimedia Commons. See, what did I tell you? Where did this come from? Some people tell me that the colour has to do with what happened before this repainting. Barely three-four months before the buses got this brown colour, they had a different colour. Notice the colours? Notice the photo of Jayalalithaa on the windscreen? I know it’s a bit difficult to see it, but can you see it. In the picture, Jaya is seen wearing a saree that is the same colour as the Maroon on the bus. Her complexion matches the beige on the bus. Tada! When the paint jobs were done, all buses sported a huge photo of the Chief Minister on the front windshield on the left hand side. They say, greens are good for health. They say Green is a sign of Eco-Friendliness. But, the leaves here don’t exactly say that do they? While MTC curiously chose to name these buses as ‘Small Bus’, not ‘Mini Bus’, they also decided to put a few leaves on it. No points for guessing why. The AIADMK’s Party symbol is: Yes, that’s right, Two Leaves! But, wait! You can see four leaves on that bus! Simple: 2+2=4. The more the merrier. Two more leaves is just going to reinforce things into the commuters head. Now, notice something common among all these Transcos mentioned? They’re all State-level bodies, not Municipal ones. You’ll never see BEST, AMTS, or PMPML like this. Why? Decentralisation of transport management ensures that while Municipal Bodies have the wherewithal to run the Transco, they won’t have the time or resources to go behind such trivial stuff. They’ll have more important stuff such as banners, roads, naming of Chowks to work in their favour. On an unrelated note: Searching for Purple Faeries on Google leads you to the Tag Purple Faeries. I call this, Purple Propaganda..
BEST slashed its AC fares by half. What happened then is obvious! BEST recently slashed its AC fares by 50%. The results of this, while obvious, are quite shocking. BEST also introduced several new routes: AS-71, AS-72, AS-318, AS-415. Earlier, NMMT and TMT AC buses would always run full while BEST buses were like Chauffeur services, with one or two passengers in some of them. The reasons were clear: BEST used its Purple Faeries while the other two use Volvos, and further, BEST charged one and a half [1.5x] times what the other two charged. But not any more. BEST’s minimum AC fares have come down from ₹30 to ₹15 while NMMT and TMT charge ₹20. BEST’s AC buses are seeing a higher patronage. BEST, whose ridership had fallen from 43lakh to 30lakh, is now trying to get it to 45lakh. Take a look below and see how two AC buses are performing. This is AS-318 at Bandra Bus Station [East] towards the Bharat Diamond Bourse in Bandra Kurla Complex. As you can see in the picture, the bus is quite full. BEST bus AS-310. Image copyright Coolguyz. This is AS-415 from Agarkar Chowk to SEEPZ. As you can see, the bus is full of passengers. BEST bus AS-415. Image Copyright Coolguyz. When was the last time you saw a BEST AC bus full of passengers? 2009? 2010. With BEST getting the new Tata Starbus Hybrid fleet soon, things are just going to improve. Of course, as stated earlier, BEST needs to get rid of the Cerita fleet soon and go for more powerful Ashok Leyland, Corona, Scania and Volvo buses to sustain this increase in passengers. Images courtesy Coolguyz from Skyscrapercity. Go ahead. Share this article. Share the joys of traveling in India’s Oldest Public Transport Company. Author SrikanthPosted on 18/08/2016 25/08/2016 Categories BEST, NMMT, TMTTags BEST, NMMT, Purple Faeries, TMT3 Comments on BEST slashed its AC fares by half. What happened then is obvious! In a move that will revolutionise Mumbai’s transport, BEST has finally decided to go one level further and upped its services majorly. Starting with the plan to ply Electric Hybrid buses in BKC, BEST has gone step further to convert some of its existing fleet into Electric buses. In a very bold and revolutionary move, the Municipal Corporation of Greater Mumbai [MCGM] has allocated ₹10crore to retrofit existing BEST buses with a a Lithium battery powered engine. A batch of five buses will be converted first on a trial basis. BEST has stated that the cost of conversion from Diesel or CNG to Electric buses has gone down from an earlier figure of ₹65lakh to ₹35lakh. Back in February, shortly after the #MakeInIndia week, BEST announced a design overhaul for its buses. The existing 12 metre long buses have an overhang beyond the rear tyres of the bus that often gets damaged when the bus gets rear ended. In order to eliminate this, 300 new buses which are 11 metre in length are being procured. These new buses will also be fitted with plugpoints for charging phones. A BEST Minibus running on Route 377. The new buses are expected to be slightly longer than these. Image copyright Karthik Nadar, CC-BY-SA 3.0 Unported, available on the Wikimedia Commons. Another major development is the proposal to introduce app-based ticketing on BEST buses. BEST has announced that it will bring out 22-seater AC midi-buses with app-based booking on them. The MCGM has budgeted ₹25 crores for 50 buses, that will be air-conditioned, fitted with a GPS-based tracker, besides offering WiFi, newspapers and drinking water. Conductors would wear a different uniform than the standard Khaki that they wear normally. This is a great exercise for branding the buses, and will help BEST create a better image for their fleet. The buses will primarily run on routes connecting Metro stations and local Railway stations, thus mainly acting as feeders. Interesting ways have been taken by BEST to improve its image, especially for its ailing AC fleet that still continues to be dominated by the Purple Faeries. With the completion of the Oshiwara Railway bridge as well as the conversion of the DC traction along the harbour line to AC, Railway services are going to get more efficient and BEST will have to match up to the Purple Dragons than run on the tracks. BEST will need to make its Red Warhorses and Red Minions [Regular and Minibuses] work smarter to ferry more people and earn more revenue to keep the city as awesome as it has been. However, the greatest bit of Publicity that BEST can get right now is that after Uber founder Travis Kalanick took a BEST, a BEST Double Decker was used to ferry Prince Henry, Duke of Cambridge and his wife, Catherine, Dutchess of Cambridge. 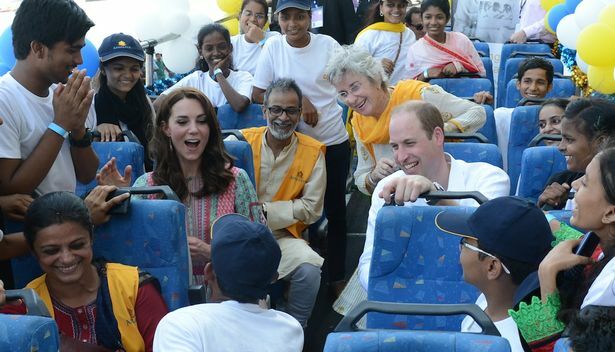 Catherine, Dutchess of Cambridge and Prince William, Duke of Cambridge on a BEST Bus in Mumbai. Image copyright respective owners. Author SrikanthPosted on 14/04/2016 14/04/2016 Categories BESTTags BEST, BKC, Electric Bus, Purple Faeries1 Comment on BEST ups its Ante! So, at the beginning of this month, it was announced that CIDCO and NMMC were planning a Cable Ropeway from Shivaji Showk, Vashi Bus Station to Teen Taki Chowk, Kopar Khairane Bus Station. So, barely two weeks later, it turns out that CIDCO gave an in-principle approval to Tata Realty and Infrastructure Limited [TRIL] to prepare a Detailed Project Report [DPR] for the project. If approved, this would be done on the “Swiss Challenge” method, wherein when a tender is floated, in which TRIL will have the right of first refusal and get an opportunity to match the best offer. Along with this, a new route has been proposed. Now here’s where it gets interesting. The new route, has been proposed from Vashi to Ghatkopar. Yes, you read that right. Vashi to Ghatkopar, across the Thane Creek. The proposal is to connect it to the Metro at Ghatkopar [which seems nearly impossible given that there is no land available near Ghatkopar]. However, it would be marginally easier to connect it to the Monorail. Or better. Connect it to Ghatkopar Depot. Get on to them Purple Faeries on AS-388 to Poisar Depot. Now, what seems to be the problem here? Building a set of pillars for a ropeway from Vashi Bus Station to the Vashi Creek. Building a set of pillars in the wetlands occupied by mangroves on both sides of the creek. Building a set of pillars on the actual creek. Crossing the Eastern Express Highway, building in Ghatkopar, and reaching the station. So at the end of the day, this will be a super problematic thing to build. However, if they are able to build it, I, for one, would be super happy. Permissions to build over wetlands and the creek itself. Variations in height. Most Ropeways/Cable Cars have a fixed gradient. This stretch would require the alignment to go up and down multiple times. Turns. Again, most systems have a straight route. This one would require zig-zags. However, the Vashi to Kopar Khairane plan is a brilliant idea. For starters, it would ease traffic on the Trans-Harbour line, the Thane-Belapur Road, as well as the Vashi Bus Station Road. Besides this, it will also provide a brilliant an scenic view of the entire city. While in most parts of Mumbai, the West saw development, in Navi Mumbai, barring Nerul and CBD Belapur, it was mostly the East, along the Highway that grew faster. It’s time to revolutionise our nations’ transport systems, and what better way to do it than the Mumbai Metropolitan Region! It is a very interesting thought and I personally feel this would work wonders to provide a comfortable mode of transport for us. As you know, we spend quite a lot of travel time to work. Now imagine this scenario, I work at the World Trade Centre in Cuffe Parade, and I live in Thane. My work times are such that I am unable to catch the A8Express, so I end up catching AS1. Now I have to contend with sitting on that bus from 8am to 10am to reach work and sit from 7.30pm to 10pm on my way back as it makes its way thru Sion, Dadar, Parel and Byculla. I’m spending close to five hours of those in a bus. Now, I, for one would be happy because I love buses. But what if you wanted to do something else? Let us assume that I want to catch up on my Television viewing instead. Now I’m a fan of Mash, Knightrider and Scooby Doo, and I hypothetically imagine that Comedy Central, Star World and Cartoon Network are playing the three of them respectively. So, I decide to record the episodes in the morning while I catch up on my sleep. I wake up, refreshed, and head to work. I finish my days work, and head back to Backbay Depot, from where I board my AS1. I want to unwind, so I pull out my phone, and turn on the latest episode that I recorded earlier in the day. What if one morning, I decided not to sleep, I could watch Scooby Doo instead. Or maybe, I recorded an episode of Alfred Hitchcock Present the previous night and decide to catch up on some intriguing mystery before I get to work? Imagine, one day, there is less traffic, and I reach home before I can finish my episode. I get home, and finish viewing it on my large screen TV. Or what if there is crucial Football or Hockey match that is going on, and I need to watch it, but don’t have the time, or am at work? I simply hit record, and watch it in the comfort of my AS1, and maybe even my home; that too with the added benefit of pausing and rewinding whenever I want. Overall, I think #TATASkyTransfer seems to be a good deal. Go for it, and if you take A8Express or A13Express, ditch those for an AS1 so you could spend more time watching the Telly. NMMT Limited: Will it succeed? NMMT Limited; after my previous post on BEST, seems to be an interesting development. Note I am only calling it NMMT Limited; the word Limited is just a figment of my imagination. Back in 2014, NMMT had a meeting with several IT service providers, including Trimax, ARS, and Atos to set up an Intelligent Transport System [ITS], which would have brought NMMT more or less along the lines of BEST. However, nothing of the sort has taken place so far. I still see NMMT issuing punched tickets, they have no Bus tracking mechanisms like BEST, and their buses are mostly rickety. However, a recent article in ToI stated that NMMT was in talks with App Developers to create an app to book an AC Bus ticket. A rather interesting development indeed. In November 2014, ten months ago, NMMT was issuing punched tickets on its Volvo bus on Route AC-105. I was given 3 tickets of ₹20, one of ₹10 and one of ₹5 for a ticket worth ₹75. This was two months after I had got my BEST smart card. The situation was the same in April 2015. A 5 rupee punched ticket issued by the Navi Mumbai Municipal Transport. Image copyright Srikanth Ramakrishnan, CC-BY-SA 4.0 International. Image available on the Wikimedia Commons. Now, with punched tickets, and no Electronic Ticket Machines in sight, this could only mean that NMMT is manually handling accounts as well. With such a system in place, how do they expect to go straight to App based bookings? How will the conductor add it to his or her tally? Or will they treat the passengers similar to the way they treat a passholder for a limited route or distance? There are a lot of questions involved in this, so let us have a look at the possible problems that might occur. Now, given the competition along this corridor, we can say that just like the Bangalore-Chennai or Mumbai-Pune corridor, if one misses one bus, rest assured they will have another one, assuming they are not a Pass holder or a BEST prepaid card holder. For most people living in Borivili, being passholders, AS700 would be the ideal choice. For those living in Thane, AC65 would be the ideal choice. NMMT ideally would be catering to commuters between Borivili and Airoli, or Thane and Airoli. One is the GPS method, which works on select routes, mostly the Western and Central lines wherein you have to be either inside the station premises or within a certain radius of the station in order for the app to work. The ticket doesn’t need to be printed and showing the app screen is enough if a TTE comes along. The second method is the Printed Ticket method. This works on non GPS enabled routes, where after a ticket is bought, it needs to be printed. A reference number is given, which can then be entered into an Automatic Ticket Vending Machine [ATVM] at the Origin Station. The ticket cannot be printed anywhere else to prevent frauds. How does NMMT plan to do this? The first method would be problematic since not all buses are equipped with GPS, unlike their purple counterparts with the BEST. The second method would be cumbersome for the conductor to punch in a number into their machine, if they have one, to log it. Since, they use punched tickets, the conductor would have to note down the number on a sheet to submit to the depot manager. All this leaves a lot to wonder. Is NMMT equipped to handle all this? Can they outdo BEST at BEST’s own game? Only time will tell us. Author SrikanthPosted on 20/09/2015 22/09/2015 Categories BEST, ETM, NMMT, TicketsTags BEST, ETM, Ideas, NMMT, Purple Faeries, Tickets7 Comments on NMMT Limited: Will it succeed? Branding Public transport has been an exercise tried out by many transport bodies worldwide, to various degrees. Few have succeeded, while few have failed in this venture. There have been multiple attempts by various transcos in India at Branding services. While Metro Rail services have had branding as an integral part of them from Day 1, the same is not the case with buses, as many of them have been in operation for several decades now. Here, I shall attempt to break-down the branding used by our transcos, as well as try and understand some lesser known details about them. In the event you want to see how branding works outside of India, there is a research paper here. Note, I have used the term CBD numerous times in the article below, for those who are unaware; CBD stands for Central Business District. It is invariably a part of the core city area where many offices exist. It is the equivalent for what Americans often refer to as Downtown. 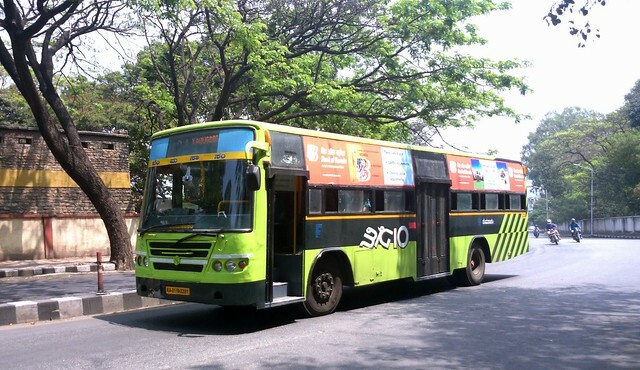 A BMTC Big 10 bus on Route G1 in Bangalore. Image copyright Ramesh NG, CC-BY-SA-2.0, available on Flickr and the Wikimedia Commons. A Volvo used on the Pune Rainbow BRTS by PMPML. Image copyright Rovan Vaz, CC-BY-SA 3.0Unported, available on the Wikimedia Commons. PMPML experimented with branding back in 2008-2009 with the BRTS, also called the Rainbow BRTS, with the PMPML procuring Volvo B7RLEs [with openable windows] to run on the bus lanes on Satara Road from Swargate to Katraj and Solapur Road till Hadapsar. A BEST Tata Starbus running on Fort Pheri 1, parked at CST. Image copyright Srikanth Ramakrishnan, CC-BY-SA 4.0 International, available on the Wikimedia Commons. Now, let us move on to BEST. The BEST launched it’s Fort Pheri services in 2011. The Fort Pheri is probably the first branded bus service run by BEST in ages. Unlike BMTC, BEST does not brand its AC services. In fact, the BEST AC services, have a rather bad image, thanks to the Purple Faeries. So much for branding. So, BEST took their aging Tata Starbus fleet, gave them a pseudo makeover of sorts by painting them with a Fort Pheri Special livery. 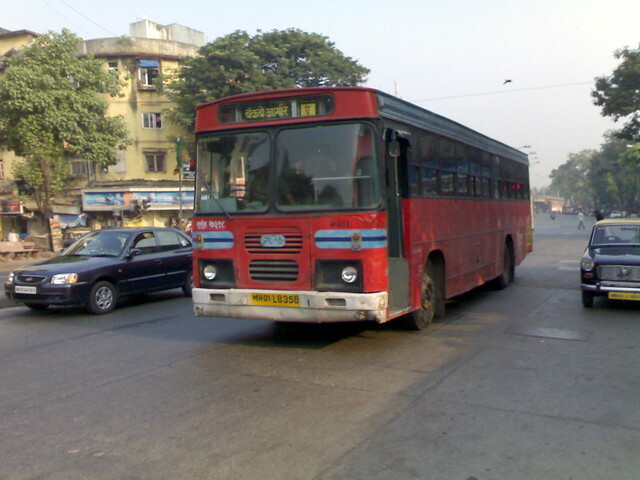 Some buses continue to operate with their original Starbus liveries, but most of them have been repainted to say Fort Pheri 1 or Fort Pheri 2 in Marathi. These buses were procured in 2004, break down very often, and thus were shifted to the Colaba Depot which is close to the route of these buses. They charged a flat fare, ran in clockwise and anticlockwise circles, and were an instant hit among office-goers in the CBD. A good move to make use of the fleet which was otherwise bleeding the BEST in terms of maintenance costs. Shortly after this, the BEST launched the Fort Pheri AC service. Unlike their non AC siblings, these buses had no special branding, but thankfully were not the Purple Faeries either. BEST decided to run all six of its Volvo buses from Oshiwara Depot to Backbay Depot on AS4, in the first six departures, park them at Backbay Depot, from where these buses would operate on Fort Pheri 1 and 2 AC till 3pm, before sending them back to Oshiwara as AS4. The remaining AS4 and A74Express would continue to have the Cerita buses on them. A BEST Volvo on Fort Ferry 1 -AC. Image copyright Superfast1111, CC-BY-SA 3.0 Unported, available on the Wikimedia Commons. Now that all the gyaan has been given, time to look at this whole exercise from a Marketing Point of View. What does Branding of Bus Services entail? Why must it be done? To answer this question, let us take a take a quick look at high-end services offered by two intercity transcos: MSRTC and KSRTC. KSRTC has branded its basic Volvo B7R services as Airawat, with the B9R being branded as Airawat Club Class. Further, the Airavat Superia is a B9R with a pantry and Airvat Bliss has a toilet. The newly acquired Scania buses are branded as Diamond Class. Similarly, MSRTC has branded its B7R services as Shivneri and B9R as Ashwamedh, and has retained the same names for the new Regular and Dual Axle Scania Metrolink buses as well. All said and done, MSRTC still carries the ST legacy. It is known as ST, and ST is an official part of the logo [in Devnagari]. While the Mahabus, and Shivneri services were launched as premium AC services, people still associated these with ST. However, that has changed a bit. Last year, when I asked a traffic police officer at Dadar for the starting point of Pune bound ST buses, he told me “You’ll not get an ST bus, but only a Shivneri to Pune“. Similar to MSRTC being called ST, BEST also has a brand readily available. The name BEST is a brand in itself. Unlike other transcos, BEST itself is a brand name. Similarly, in Tamil Nadu, TNSTC buses are referred to as Arasu Perundu which literally translates to Government Bus. Some transcos use a logo to identify themselves with, for example the Ahmedabad Janmarg, the Delhi Transport Corporation, Navi Mumbai’s NMMT, and even the BMTC. The BMTC logo is nothing but the Gandaberunda, which is a Mythological bird with two heads; used as a logo for most entities under the Government of Karnataka, even KSRTC and the other sister bodies in North Karnataka. Even BEST these days is seen with its logo, a bus inside a lamp, seen now as the watermark on tickets and often on the front of an AC bus, above the display. You live in the suburbs of Mumbai. You rarely come down to Fort, simply because you don’t have to. One day, you make it to CST because you need to go to the National Centre for the Performing Arts [NCPA]. Would you rather take a Bus number 108, or a Fort Pheri 1? You live in East Bangalore. You need to head to Banashankari one day. Would you rather take a Bus number 500A or a Big Circle C-1? The most logical reason why anyone would want to market anything: To increase the number of customers and improve revenue streams. With the advent of cab aggregators like Ola and Uber, buses are losing out big time. To give a feel good factor to the commuter. Passenger comfort is crucial. In a city like Bangalore, a person may get out of a bus and hail a cab, or in Bombay, take a train, if the bus is not comfortable. A higher fare. A branded service is a premium service, it can have a higher fare, like BMTC does with the Vayu Vajra series, which have much higher fares than the regular Vajras. There are exceptions however, like the Atal Sarige, again run by the BMTC. Make optimum use of existing properties: BEST re-branded its aging, semi-retired, nearly decommissioned fleet of Tata Starbuses for the non-AC Fort Pheri, and the idle Volvo buses for the AC Fort Pheri. Similarly, when the Kendriya Sarige flopped, BMTC used the Volvo buses on regular routes to Electronics City and Bannerghatta. At the end of the day, transport is very important, since our lives depend heavily on it. Not many of us are lucky enough to live close to our workplaces or daily commute destinations, and those of us who don’t, will end up taking public transport. When other things around us a branded, why not transport? If a person pays ₹180 for a coffee at Starbucks, instead of ₹20 at a roadside stall, he or she is doing it for the brand value. Similarly, one might walk in to a fancy parlour and spend ₹500 for a haircut, that the barber under the tree might charge ₹30 for. When everything else can be branded, and packaged as a premium item, why not transport? After all, a good transport system is not one that is used by all the poor people, but one that gets the rich to give up their cars instead. Looking at BEST, it can certainly brand its services as premium, and offer a better travel environment to the daily commuter. BEST branded their Limited Stop Buses, plainly as Limited, and its Express services with the C-series of routes. It is now upto BEST to rebrand its AC services as well, as mentioned in the earlier post. Unlike BMTC, who branded Volvo and Corona services as Vajra and AC Tata Marcopolo services as AC-Suvarna, BEST branded all its AC services as AC, a move that MSRTC has also seemingly done. Unlike KSRTC, MSRTC treats the Shivneri and Ashwamedh on par and charges the same rates for the two. I look forward to some interesting feedback from those who are in the marketing and branding scene. Please do leave your comments in the section below. If you liked this post, please do consider hitting the Flattr button below for some microdonation love. BEST and AC buses don’t exactly go hand-in-hand. Atleast not anymore. BEST should think of a way to reverse that. One of the original Ashok Leyland AC buses that the BEST procured in 1998. Image copyright, Ojas Parab, Flickr. These buses ran mostly in the mornings and evenings, mainly serving the office-crowd. In 2008, under then General Manager Uttam Khobragade, BEST procured the first set of their purple ”Kinglong” buses. It took a lot of time to figure out that these Purple Faeries weren’t actually Kinglong buses. These buses were assembled in Punjab by Jaycee Coach Builders Limited [JCBL] and sold under their ”Cerita” brand. A BEST Cerita running on route AS 461. Image copyright Srikanth Ramakrishnan, licenced under CC-BY-SA 4.0, available on the Wikimedia Commons. These buses were powered by CNG, and unlike other AC buses, didn’t have a slave engine to power the air-conditioning unit, thus resulting in slow speeds and bad pickup. In simple terms, they struggle to climb the simplest of slopes. Yet, they had comfortable seats. These Purple Faeries used to breakdown frequently and some of them caught fire, thus leading to deteriorating quality of BEST AC services. Somewhere around this time, BEST received a CNG version of the Volvo 8400 on the B7RLE chassis for trial runs. After a few weeks of trial runs from the Oshiwara depot, the bus was transferred to the Wadala Depot, after wihch it was returned to Volvo. Unfortunately, BEST never purchased the bus. It had a separate Slave Engine to power the AC, thus overcoming all the shortfalls of the Cerita buses. Post this, BEST inked a deal with an advertising firm called Asian Concierge who were ready to supply BEST with 50 Diesel-powered Volvo 8400s in exchange for full body advertisements on them for 15 years. The deal was quite revolutionary and would have changed the transport scene, however, only 6 buses were procured. All of them belong to the Oshiwara Depot and ply on AS-4 between Oshiwara Depot and Backbay Depot. A BEST Volvo on Route AS-4 from Backbay Depot to Oshiwara Depot. Image copyright Srikanth Ramakrishnan, CC-BY-SA 4.0 International, available on the Wikimedia Commons. Now, the deal is that BEST, which was among the first Transcos in India to get AC buses is slowly phasing them out because of competition from the TMT, NMMT and MSRTC. For starters, BEST used to run a bus AS-505 from Santacruz Depot to CBD Belapur. They curtailed it because NMMT flooded the roads with AC-105 which ran from Bandra Bus Station to CBD Belapur. When I requested BEST to restart AS-505, they replied stating that it was a loss making route, and hence would not be possible. However, BEST’s 505Ltd is among the most profitable routes in the sector. Subsequently, NMMT has launched AC-106 which goes to CBD Belapur via Nerul (West). AC-105 remains their most profitable route. BEST 523 Ltd has 42 stops. BEST 525 Ltd has 36 stops. BEST AS-524 has 23 stops. NMMT AC-123 has 43 stops. NMMT AC-125 has 36 stops. This makes BEST the fastest on this route. With fewer stops, any bus runs faster. This is the theory under which Limited Stop Services normally operate. TMT runs a bus from Cadbury Junction to Agarkar Chowk in Andheri East. This bus enters Mumbai via the Mulund (West) Check Naka and takes the same route as AS-422 to reach Andheri. It travels a total of 3.5 km within Thane and close to 21km in Mumbai. NMMT’s Borivali to Kharghar routes overlap majorly with BEST’s AS-461. As if all this was not enough, the MSRTC, went one level over all of this, by launching their now-discontinued Shivneri Corporate service. These buses where the regular Shivneri Volvo B7R buses running along the Kandivali-Bandra Kurla Complex [BKC] route, non-stop. BEST plies A77Express on the same route, at the same hours. The only difference was that A77Express started from Gorai, took all flyovers on the Western Express Highway and had a total of 20 odd stops while the Shivneri had none. The service was soon shelved because the fare of ₹100 one way was too high. BEST must start looking into the profitable routes of the competition and find ways to maximize its revenue streams there. One must remember that all TMT and NMMT AC routes enter Mumbai. None of them are entirely within their territories. BEST here has an advantage that they must make use of completely. Electronic Ticketing Machines and the Public Information System are two features that only BEST has in its kitty. Prepaid cards, a Daily Pass system for AC buses, and GPS based tracking of buses is what can help position BEST above its competition. BEST must also pursue the matter with Asian Concierge for the remaining of the 50 Volvo buses so that newer routes can be planned. BEST must allocate these buses onto these routes. Restart AS-505 from Santacruz Depot to CBD Belapur. Run it every half an hour. Make sure the Bus Tracking system works for it. Start a bus, exclusively for the Western Suburbs. It can be on the lines of AS-4 from Oshiwara, but should terminate at Bandra, and can take alternate routes like going into Seven Bunglows and taking the route taken by 56. Run it at half hour intervals. With rising auto fares, people will definitely take these buses. Start similar buses along the Central Suburbs in both West and East. Increase the frequency of AS-6 which connects Backbay Depot to King’s Circle. Let this be a bus that connects the Central Part of South Mumbai. Similarly run a bus from Backbay to Chembur along the Eastern areas. The Western part of South Mumbai is served by AS-4, whose frequency should be increased. Start an AC bus from Mantralaya to CBD Belapur and to Kopar Khairane. Route these buses via Tadeo, Lotus (Worli) and then go towards Navi Mumbai. Perhaps an Express service can work here, via the Sea Link, land up at Sion and go on to CBD Belapur, while avoiding Vashi Bus Station. BEST must innovate and provide more options for commuters. BEST has an edge over the other two players, which it is sadly not making good use of. Being India’s oldest Public Transport Corporation, I hate to see BEST lose out to newer entities who are just flooding the roads with their buses, and turning BEST buses into Bus. No 8954. In 2015, BEST brought out some drastic measures including curtailing of a few routes, reducing frequencies of AS700, cancelling AS706, and scrapping AS422 on Sundays. Early 2016, NMMT placed orders for Volvo B7RLEs that were Diesel-Electric Hybrids. Shortly after that, MMRDA purchased 25 AC Tata Starbus Electric-Diesel Hybrids which would ply on dedicated lanes in Bandra-Kurla Complex. The impact of it, is to be seen.